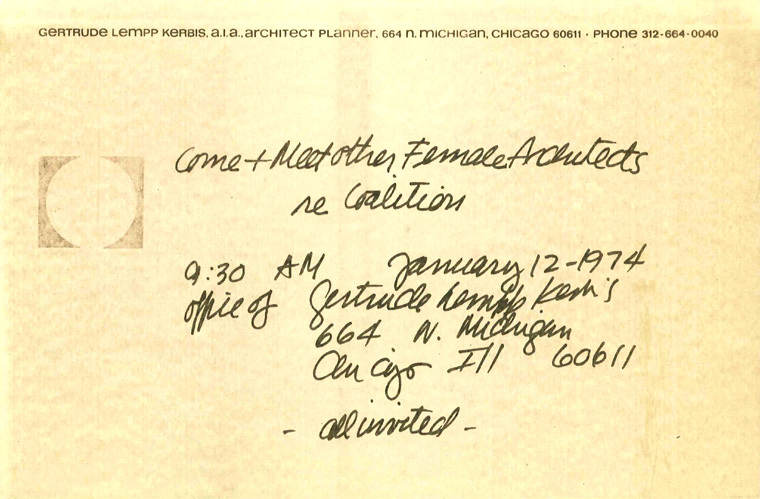 Chicago Women in Architecture, First meeting invitation, 1974, Chicago. The year 2014–15 marks the significant achievement of forty years since the first meeting of Chicago Women in Architecture (CWA). CWA is highlighting this milestone with special programming throughout the year. The main event is an exhibition documenting Chicago women and their achievements in architecture and design over the past forty years, in particular, looking at how diversity has impacted this progression. The opening reception of the exhibition coincides with the 2014 American Institute of Architects National Convention, which will maximize impact and exposure by drawing a national audience. A series of programs supporting the exhibition are also planned. These programs enhance the vocational and public knowledge of how the political/cultural landscape has been influenced by women architects, and illustrate our aspirations for the future. Marsha Spencer, former president of CWA and chair of the CWA Fortieth Anniversary Planning Committee, has been actively involved with CWA since 2005, serving on several committees throughout the years, including as president for two years. Spencer has seventeen years of architectural experience in small- and large-scale residential, educational, and medical facilities. Bethany Fleming is a museum professional with over fifteen years experience in museum, exhibit, and interpretive development. She holds a BA from Valparaiso University and an MA in public and American history from Loyola University Chicago. Previously, Fleming was the director of museum experience at the National Hellenic Museum, the director of collections and exhibitions at the Illinois Holocaust Museum and Education Center, and curator of collections at the Geneva History Center. She has worked with many organizations to create engaging museums and exhibitions, including Mackinac State Historic Parks, the New-York Historical Society, and the Chicago Bears Football Club. Chicago Women in Architecture was founded in 1974 as a professional membership organization devoted to the promotion, support, and mentorship of women in architecture and related fields. CWA hosts informational, educational, and networking events that address current issues and trends in architecture. To provide support for the next generation, we administer a yearly scholarship awarded to women in the last two years of their advanced studies in architecture. The Chicago Architecture Foundation has advanced public interest and education in architecture and design since 1966 by inspiring and challenging public audiences to understand the environments that shape their lives. CAF is ranked as one of Chicago's top cultural institutions, serving nearly 500,000 people annually through exhibitions, programs, and tours that are designed to enhance the public's awareness and appreciation of Chicago's outstanding architectural legacy.